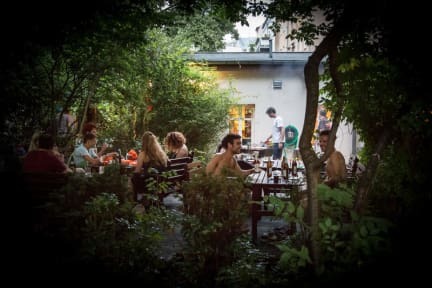 EastSeven Berlin Hostel has a lot of thoughtful little extras like a printer, bike rental, happy hour, umbrellas and hairdryers, so it's little wonder they were rated #1 in Germany at the 2015, 2009 and 2008 Hoscars. This very clean hostel also features a large self-catering kitchen and an outdoor BBQ area where 'it's really easy to meet people if you are travelling alone', according to Hostelworld guests. It's also close to the great bars, restaurants and shops in Prenzlauer Berg as well as Alexander Platz and Museum Island. “Best Hostel Germany 2015” You nominated us as Top 10 Hostels every year since 2006 - incl. the Cleanest Hostel Worldwide in 2005! Also highly recommended by Lonely Planet, Let's Go, Rick Steve's, etc. - maps, information and recommendations on where to go. - central heating and 24h hot showers! - hang out in our kitchen, cozy lounge, green and quiet garden - fancy having a BBQ? The hostel charges the given credit card in advance and we will cancel a booking if this does not work! The hostel charges 3 days before arrival the value of the first night for regular bookings, and the full amount directly after booking for non-refundable bookings. If we cannot charge the card the property will send an email about that and if you don't provide valid card details within 24 hours we will cancel the entire booking. You are responsible to check your emails and also the spam filter. This is NOT a party hostel and we do NOT have an elevator! NO stag or hen parties, max. of 8 people per group (even if you make several smaller bookings) and no persons under 18 (unless accompanied by a parent and booking a private room). BUT we are (very) clean and offer a lovely, relaxed atmosphere where you can feel at home, easily chat to our staff and make new friends. Hang out in the garden and use our well equipped kitchen to prepare your own food - and if you feel like it, maybe even cook dinner for your fellow travellers - we provide the foodstuff and a little extra on top. We offer an all-you-can-eat continental breakfast with proper Italian coffee and good tea for a very low price - or get a voucher for some of the nice cafés in our neighborhood. Our Hostel is conveniently located between the hustle and bustle of Mitte (the city's central district) and charming Prenzlauer Berg. We're surrounded by cafés, restaurants, bars, clubs and great shops and you can walk to Alexander Platz (the heart of Berlin). EastSeven was a fantastic place to stay! Staff was incredibly accommodating and so helpful. The place was kept very clean and there are many signs up reminding people of the importance of cleanliness which is always good to see. The location is fantastic, metro is 2 minutes away, and city centre is only a 30minute walk. Highly recommend this hostel!! Great Hostel. Stayed about a week. Nik and Roman and rest of staff (forgot their names) were extremely hospitable. The hostel draws a very cool and diverse crowd of people. Great opportunity to socialize. Rooms were very clean. Bathrooms very clean. Great place to get your laundry done as well. Location was great right next to the U2 subway line and can get anywahefe from there. Great location to walk to many places as well. Would definitely stay again. Really great hostel with friendly staff and a nice common area. Good garden too (unfortunately too cold whilst we stayed). Bathrooms are clean and we never had to wait! The €3 breakfast is good, worth it for the coffee alone which is delicious and unlimited! Close to transport and walkable to alexanderplatz. Clean rooms. Felt very safe. Would definitely stay again next time I’m in Berlin! I had a wonderful experience at this hostel. The staff were humble, fun and kind. They went out of their way to make my stay comfortable. They have the best kitchen I have seen in a hostel with a commerical style stove - it made me want to cook! They have organized social outings, a smoking room, and a nice lounge with couches so it's easy to make friends. The bed and linen are better quality than a lot of hostels. Lastly, the washrooms are ALWAYS clean. Thanks East Seven? Great kitchen, awesome garden and overall great hostel. It is tucked into a pretty cool neighborhood in Berlin, with a metro stop near by. Would definitely stay again. The door is a problem. It cannot be automatically locked. Shared bathroom may not be very convenient but okay. Staff was very friendly and willing to give all the information I need. Its quite complicates since we have to put the cover by ourselves and take the cover to the receptionist when we checkout. Its weird, im experiencing it only in this hostel. Other hostel in Berlin still better i think. I think what makes us special is that we're a well-organised, relaxed hostel in a cool and safe neighbourhood. It's a small and personal hostel - but also professionally managed. We offer a lot of extras to our guests, like free Wi-Fi, powerful hot showers, a private garden with a BBQ and happy hour from 8 to 10pm, with beer that's â'¬1 for 0.5L. Within walking distance you can find Alexanderplatz, Museum Island, Mauerpark, Kollwitzplatz and more. I recommend people take a walk down 'Casting Alley' (Kastanienallee) and then walk through Mauerpark to the Wall Documentation Centre.